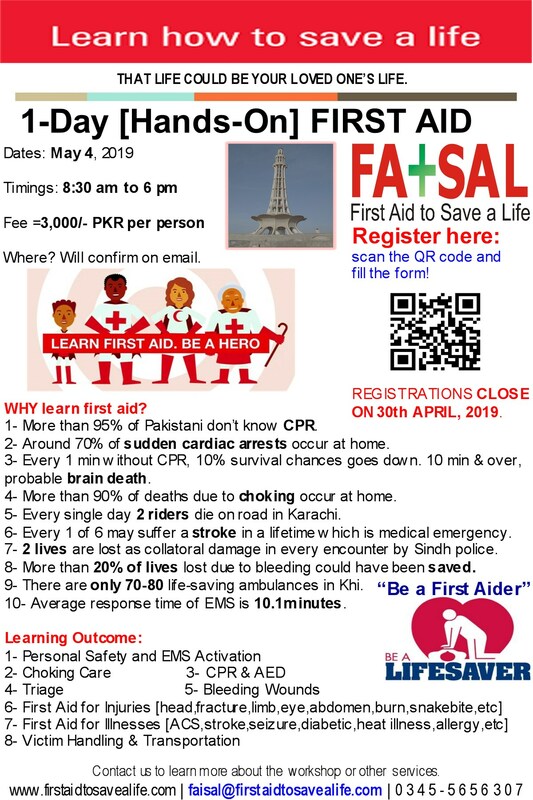 First Aid to Save a Life (FATSAL) is pleased to announce 2-days “CPR, AED & First Aid” International Training Certification by MEDIC First Aid International in Lahore on February 9-10, 2019. The course fee is =14,500/- PKR per person inclusive of course book, certification, quick wallet card, refreshment/s & lunch. You’ll also receive a participant’s handbook and wallet card for quick revision/easy-to-read text that will walk you step by step through a variety of lifesaving skills. The skill card will also serve as an excellent refresher and reference tool after training is complete. This entry was posted in First Aid CPR and AED and tagged 1st aid training, accredited training program, CPR and AED training in Lahore, cpr training, CPR training in Lahore, first aid cpr and aed training, first aid training, first aid training in lahore, hands-on training, islamabad, Karachi, Lahore, medic first aid international. Bookmark the permalink.